How waste management in Indonesia is being modernised (KfW Group/Thomas Schuch, Dr Christian Chua). Jumini is standing on a hill, which, from the grassy side, could almost be described as pretty. If you drive around the hill however, you can see that the 15-metre-high hill is made of rubbish. Jumini doesn't seem to mind despite the heat, the stench and the swarms of insects surrounding her. On the contrary; for her, waste is anything but a problem. It is her livelihood. By collecting bottles, jars, cans and cartons, she earns around 30,000 Indonesian rupiah, or 1.80 euros a day. It is not much, but it is enough to provide for her two children. They live 1,300 kilometres away, with their grandparents. 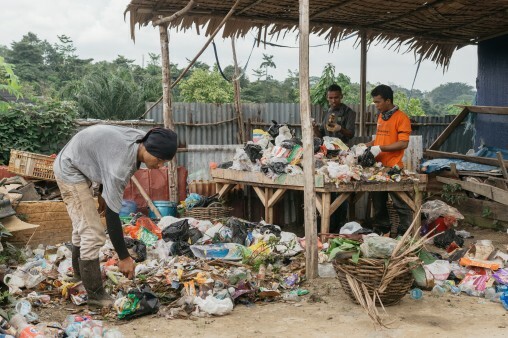 Jumini is one of around 150 waste collectors at a landfill site in central Sumatra. 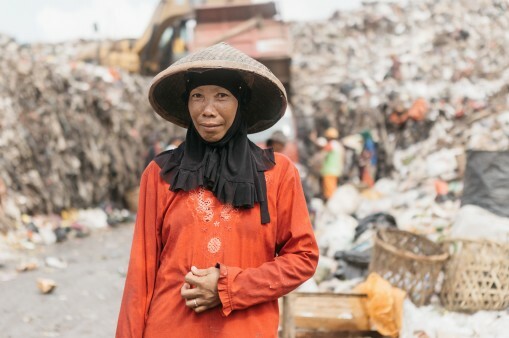 She works for Taswi, who at 62 is the oldest and has been employed for 21 years by TPA Talang Gulo, the official name of the landfill site in Jambi. As the informal sector goes, the work is organised surprisingly formally. Employees work in shifts, a warm lunch is available and there is a team leader. 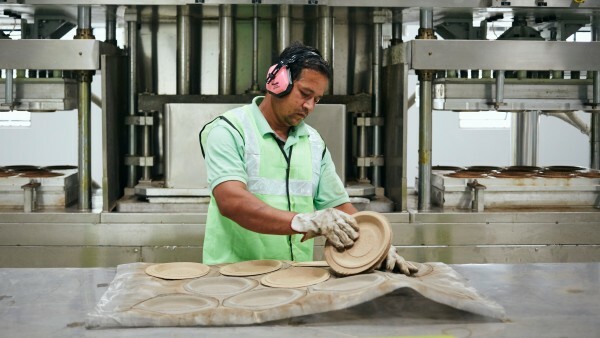 Taswi used to work on rubber plantations, but would not want to do that anymore as he likes his current job much better. "There will always be waste", he says with certainty. For this reason, the outlook for his personal future appears to be rather positive. 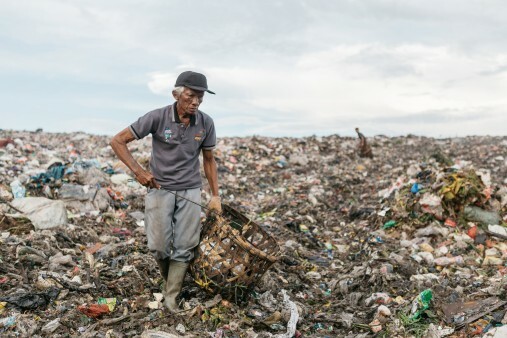 Living from the waste of others - Taswi is 62 years old and has been working at the dump in central Sumatra for 21 years. He is also the oldest waste collector. Waste collector and mother - Jumini is one of about 150 female waste collectors. She provides for herself and her two children, who live far away with their grandparents. Pile by pile - The dump is called TPA Talang Gulo. Waste collectors work in shifts to sort through the piles for rubbish they can sell. Income opportunity - The waste collectors earn less than two euros a day by selling their yield. Cleanup - In the nearby residential area, waste collectors also sift through the residents' rubbish. 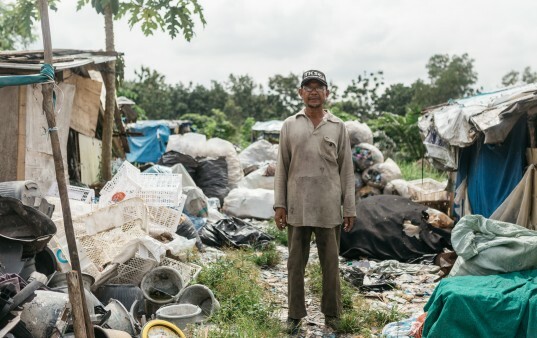 Taswi is 62 years old and has been working at the dump in central Sumatra for 21 years. He is also the oldest waste collector. 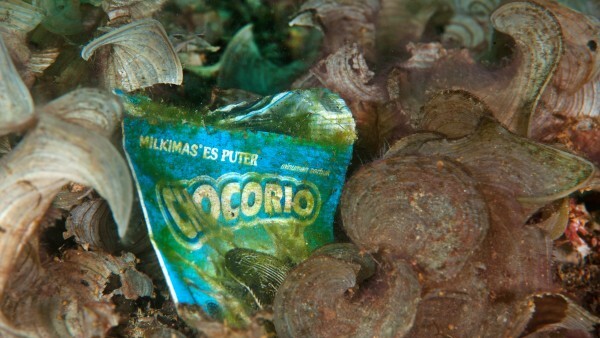 Around a third of Indonesia's plastic waste makes its way into the ocean. Barriers like this one in Jambi are designed to stop big pieces of rubbish from getting there. Minister Luhut Binsar Pandjaitan, who is responsible for maritime affairs, has a totally different view of waste. At the COP 23 Climate Change Conference in November 2017 in Bonn, he highlighted the issue of plastic waste, calling it "one of the most important problems to solve". He also announced his country's plan to reduce this waste by 70 per cent by 2025. This is no small task; every year, 3.2 million tonnes of plastic waste in Indonesia are still not disposed of correctly and end up in the environment. More than a third of this waste finishes up in the sea. With an annual discharge of around 1.3 million tonnes of plastic waste, Indonesia is the second-largest source of marine litter in the world. Figures like this may look abstract at first, but become alarmingly clear when you draw some comparisons. The amount of litter which ends up in the sea each year on a global scale is at least eight million tonnes, which corresponds to one dustbin lorry dumping its load into the sea every single minute. 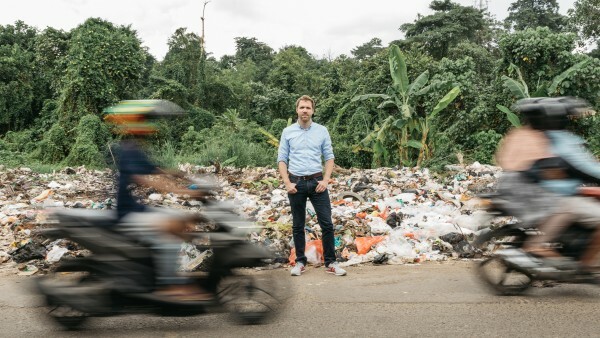 Jonas Dylla is KfW's project manager for waste in Southeast Asia and is happy that people are finally paying more attention to the issue of plastic waste. However, it only becomes crystal clear when yet another whale is washed up on shore, which is what happened in November 2018 on the coast of Sulawesi. The stomach contents of the dead sperm whale provided more evocative images than all the photos of mountains of rubbish, litter lying on the ground and plastic bottles floating in rivers put together. The WWF painstakingly listed more than 1,000 individual plastic items, which had a combined weight of around 6 kilos and included 115 plastic cups, four plastic bottles, 25 plastic bags and two flip-flops. Newspapers around the world rushed to report on the story. As shocking as the discovery was, it had an effect. Jonas Dylla, a KfW project manager responsible for waste in Southeast Asia, calls this a "tailwind". "That was an important boost for our projects", he says. He is pleased that the issue is now receiving the attention it has long since deserved. Until now, waste has usually been low down on priority lists and neglected with respect to funding and level of public interest. Now the connection can be made: it is possible to find plastic packaging items for products that are available in Germany in a whale lying on a beach in Indonesia, proving the global nature of the problem. The solution to a problem that previously seemed far removed, affecting the other side of the world, has suddenly become a project which affects everyone. Dr Peter Schoof is the German ambassador in Jakarta. He sees protecting the oceans as an international lifelong task. 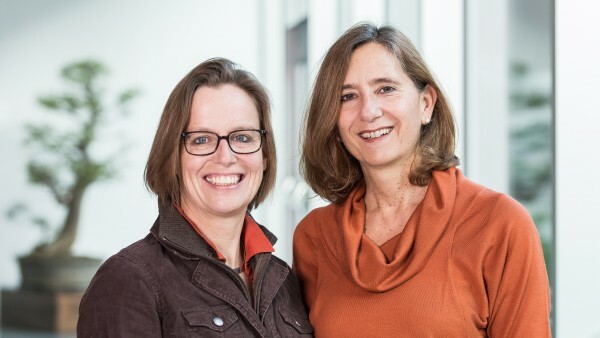 On behalf of the Federal Government, KfW, together with the European Investment Bank (EIB) and the French Development Bank (AFD), has established the Clean Oceans Initiative. 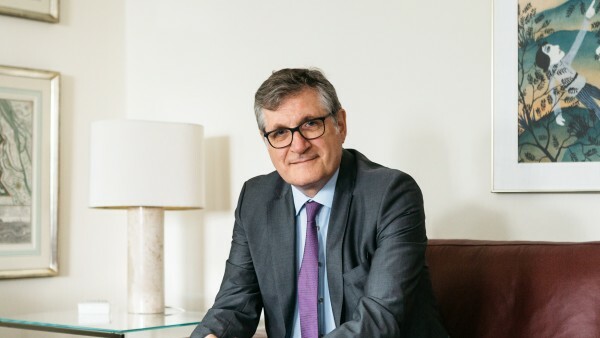 According to Dr Günther Bräunig, KfW's CEO, the initiative's objective is "to pool and expand our respective activities to protect the world's oceans". In concrete terms, according to a joint statement, the three institutions are providing EUR 2 billion for projects aimed at reducing marine litter, especially plastics, and the discharge of untreated wastewater. Now that the issue of waste is getting the attention it deserves, project manager Jonas Dylla does not need to start his work from scratch. KfW has been helping to establish a functioning waste management system in Indonesia for six years. 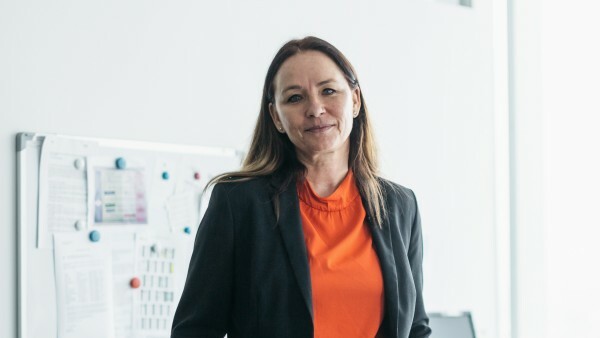 Speaking about the commitment, Angela Tormin, KfW office manager in Indonesia, says: "Starting was not easy, but our cooperation in the waste sector is now growing constantly and we are proud to be one of the most important partners for the Indonesian government in this area". Angela Tormin, KfW Office Manager in Indonesia, is pleased to see more cooperation in Indonesia's waste sector. 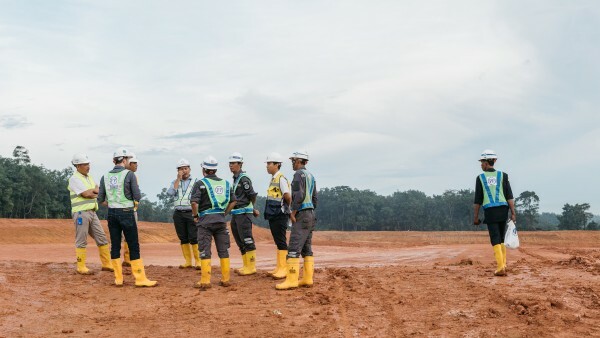 At the moment, EUR 75 million is available for the construction of landfills with sorting and composting facilities in Jambi, Sidoarjo, Jombang and Malang. A further EUR 7.6 million will be used to ensure that municipalities are ready to operate these facilities in a sustainable way, to organise proper waste collection and to convince the population of the importance of "the three R's" – reduce, reuse and recycle. The implications of these financial contributions is clear when you stand on the old landfill site with the rubbish collector Jumini. Direct in your line of vision, right next door, the foundations have been laid for the construction of the new landfill site. 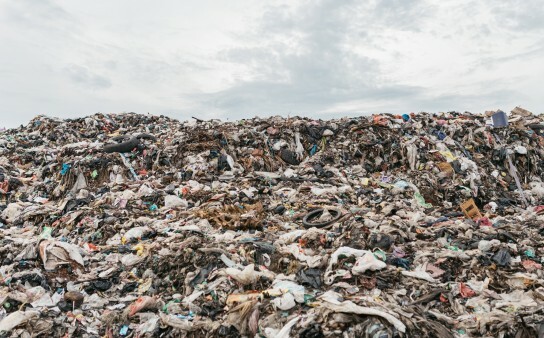 In the foreseeable future – two years according to current plans – this landfill site will be put into operation and the present mountains of rubbish will be turned into green grassy hills. 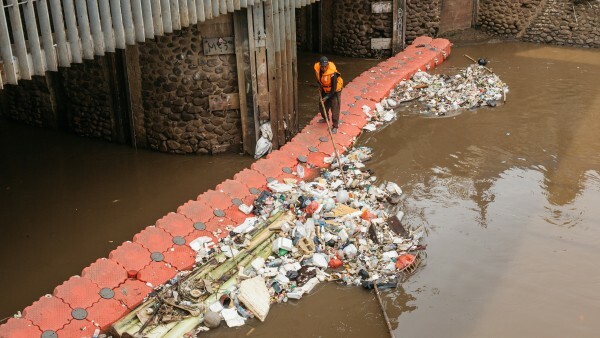 And, more importantly, there will be no more uncontrolled accumulations of waste, and the usual disposal of rubbish in the landscape or rivers will be a thing of the past. Some may have their doubts as to whether planting grass on rubbish is such a wise idea. Bernhard Schenk, an independent expert who has been assisting with KfW waste projects for 15 years, understands this thinking. "The disposal method that was developed in cooperation with the Indonesian government is currently the best compromise in terms of cost efficiency and environmental protection", he says. Burning the rubbish would be too expensive and a waste of resources. Schenk stresses that efforts to reduce waste and to recycle it must run in parallel. The rubbish collector Jumini takes a completely different view. She is worried about losing her source of income. ”I do not know if we will still be allowed on the landfill site when the new facility is open", she says. This concern is not entirely unjustified as there are strong arguments against opening the new landfill site to the informal sector for safety reasons. Consultation at the construction site. A new landfill will be created here. However, KfW project manager Jonas Dylla points to the commissioning of recycling and sorting facilities. This will also create jobs for people like Jumini. Jumini is not willing to reveal whether this has reassured her or not. The new landfill site in Jambi of course does little to eradicate poverty nor does it solve the waste problem in Indonesia. When considering the big picture however, it is an important puzzle piece in terms of the enormous effort required to clean up the world's oceans. And if everything works out, Jambi can serve as a model for other regions not just in Indonesia.